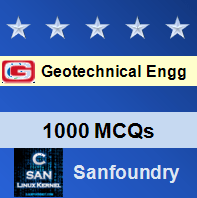 This set of Geotechnical Engineering Multiple Choice Questions & Answers (MCQs) focuses on “I.S. code method for computing bearing capacity”. Explanation: IS code (IS : 6403-1981) recommends a bearing capacity equation which is similar in nature to those given by Meyerhof and Brinch Hasen. 2. According to IS code, there are __________ types of failures of soil support beneath the foundation. Explanation: The code recognizes, depending upon the deformation associated with the load and the extent of development of failure surface, three types of failures of soil support beneath the foundations which are general, local and punching shear failure. Explanation: The bearing equations applicable for strip footing shall be modified to take into account, the shape of the footings, and inclination of loading, depth of embankment and effect of water table. Explanation: According to IS (6403 -1981) standards, the shape factor for circle base is 1.3, 1.2 and 0.6 for S c, S q and S γ respectively. Explanation: The depth factor can be applied only the back filling is done with proper compaction. Explanation: The effect of the water table is taken into account in the form of correction factor W’ applied to the wedge term. Explanation: If the water table is located at the depth D or likely to rise at the base of the footing or above, then the value of W’ shall be taken as 0.5. Explanation: For cohesionless soils (c=0), Indian standard code recommends that the bearing capacity can be calculated i) based on relative density or ii) based on standard penetration resistance value, and iii) based on static cone penetration test. Explanation: Indian standard recommends that the standard penetration resistance is determined at a number of selected points at intervals of 75 cm in the vertical direction or change of strata if it takes place earlier. Explanation: The value of cohesion c can be obtained from unconfined compression strength test. Alternatively, cohesion c may be determined by static cone resistance q c using the empirical relation between q c and c.